The news agency reported that fire brigade of the Islamic Waqf extinguished the flames before the fire could have inflicted any damage. Only a handful of people know that a fire also broke at the Al-Aqsa Mosque as the flames devoured centuries old Notre-Dame Cathedral in Paris as world watched in horror. Citing the Palestine News Agency, Newsweek,com reported that a guard said the fire broke out in the guard's room outside the the roof of Marwani Prayer Room located underneath the southeastern corner of the Temple Mount which contains both the Dome of the Rock and Al-Aqsa Mosque. Citing a report run by Jordan's Al-Mamlaka TV, Newsweek quoted Jerusalem Waqf and Al-Aqsa Mosque Affairs Department Director General Sheikh Azzzam al Khatib as saying that the fire erupted in the courtyard and preliminary information suggested that it may have been caused by children tampering in the area. Paris was struck in its very heart on Monday as flames devoured the roof of Notre-Dame, the medieval cathedral made famous by Victor Hugo, its two massive towers flanked with gargoyles instantly recognisable even by people who have never visited the city. 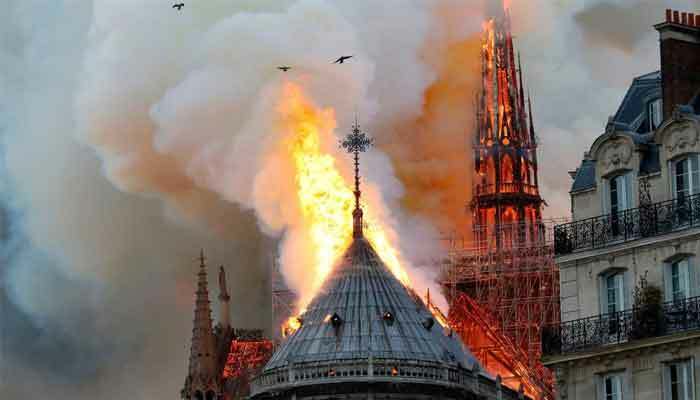 Thousands of Parisians poured into the streets to watch as the fire spread, overwhelmed by the catastrophic damage to a global heritage site visited by nearly 14 million tourists and Catholic faithful each year. The sense of loss was etched on onlookers´ faces, many wiping away tears as they contemplated the prospect that the Notre-Dame they knew might now only been seen in history books.